At fourth level a third plain non-tiled layer and a fourth tiled layer gets added to the top. The chimney shifts to the front left. At Fourth level the Town Hall has 2,100 , the upgrade cost is 25,000 and last for 1 day. After finishing of the upgrade You will get the Experience: 293 . 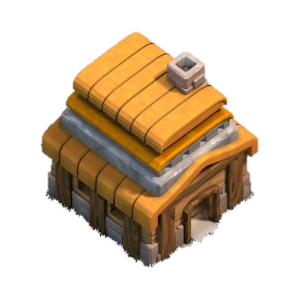 At this Level the Town Hall can store the following maximum amount of Resources: 50,000 and 50,000 . 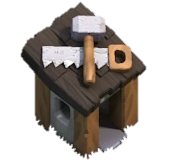 Fourth level of the Town Hall allows you to build 7 additional Buildings (Total is 34, including the Town Hall itself, Traps and 5 Builder’s Huts). The number of available sections of the Walls is increased by another 25 (Total is 75).